Clover Downs Estates is located at 17769 57 Avenue in the heart of Cloverdale next to west. Clover Downs Estates was built in 2009 consists of 91 units close to shopping, transit, restaurants, Casino and schools. Clover Downs Estates features exceptional quality, craftsmanship, interior features, detailing and a very large range for floor plans for homebuyers to choose from. Clover Down Estates is well built and has Rain Screen technology. There are lots of exterior lighting and well lit pedestrian pathways for your security in addition to full insulation between suites and sound buffering. 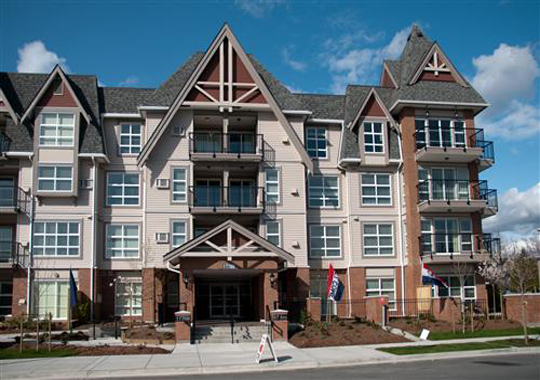 The new Cloverdale Clover Down Estates condominiums has professionally landscaped grounds and low maintenance vinyl siding with wood trim on the exteriors. The 91 condominium complex at Clover Down Estates Cloverdale real estate community is within the heritage district which is within Family Town with three Christian schools, two secondary schools, Kwantlen University College as well as 10 elementary schools and Cloverdale Campus for Trades and Applied Technology. There are also 10 medical clinics and 18 churches in Family Town Cloverdale real estate district. The residential building is a low rise at only four storeys.